Portsmouth is one of seven cities of Virginia’s Hampton Roads region. Portsmouth, together with the cities of Hampton, Newport News and Norfolk forms the port of Hampton Roads. 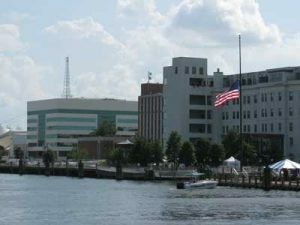 Located along the banks of the Elizabeth River, the City of Portsmouth contains military installations, shipping facilities, and other industry. The Elizabeth River Ferry carries passengers between Portsmouth and Norfolk. The ferry departs from High Street Landing and North Landing in Portsmouth and arrives at Waterside in Norfolk. A water taxi carries passengers between Olde Towne Portsmouth and downtown Norfolk. The OldeTowne Portsmouth district is famous for its historic buildings, antique shops, book stores, art galleries, and other attractions. Olde Towne Portsmouth hosts several annual evetns, including the Seawall Art Show, Olde Towne Scottish Walk, music festivals, and others. Popular attractions include the Children’s Museum of Virginia, Courthouse Galleries, Portsmouth Lightship Museum, Portsmouth Naval Shipyard Museum, and the Virginia Sports Hall of Fame. The Portsmouth the Bide-A-Wee Golf Course is another popular attraction. Owned by the City of Portsmouth, the course is located at 1 Bide-A-Wee Lane off of Greenwood Drive. In 2009, the City of Portsmouth was designated a Coast Guard City.